A mold for the part is designed using CAD software. THe part mold is built, typically as one or more inserts in a steel frame. 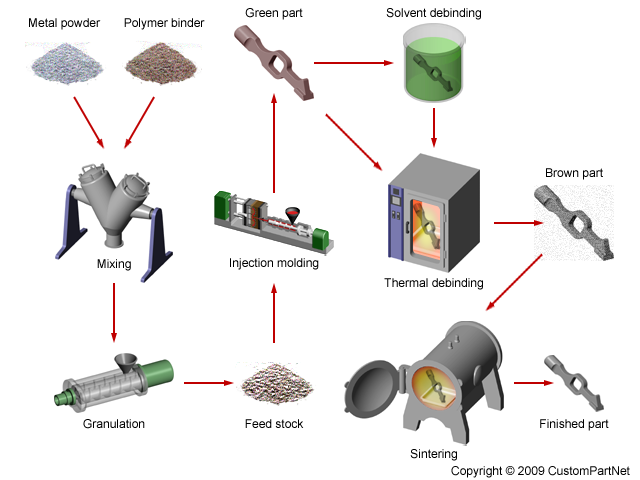 Extremely fine metal powder is mixed with a binder such as plastic to produce a feedstock.Metal powder of fine particle size is mixed with thermoplastic polymer to form a mixture of ingredients known as feedstock. The feedstock made into pellets and fed into the moulding machine. The feedstock is injected into the mold, much like standard plastic injection molding, to form the part.THe feedstock is heated to melt the plastic and molded to the desired shape. The moulded parts is known as green part. The molded “green parts” are heated in the precence of a catalyst to dissolve most of the binding materials.The binder is removed thermatly by heating to around 4000 degree centigrade from the green part, by a debinding process. The debound parts called as brown parts and is brittle and porous. The debound parts are placed into a furnace and heated up to as much as 2500 degree F. to fuse the metal particles into a dense, solid part.The brown parts is heated to more than 1200 degree centigrade, in the finale sintering process allowing the part into a dense solid with the elimination of pores. The sintered density is similar to a casting at about 98% of theoretical. The finished metal parts are either ready to ship or may require secondary operations such as hole tapping or heat treating.